I miss Ulduar. I have a suspicion that it ranks up there as the raider’s choice raid instance of all time. From the pacing, to the art, the difficulty and so forth, it has a fond place in the hearts of most Wrath raiders. But what exactly about Ulduar made it so enticing? How can Blizzard recreate that feeling of wonder and accomplishment in future raid instances? The one that did it for me the most was that it wasn’t a typical dungeon like atmosphere. It wasn’t dark or dreary. It wasn’t like Black Temple, Icecrown Citadel or Blackwing Descent. It’s not the standard dark and dank dungeon. It was way brighter and had more variety with the different rooms. Granted, you had to siege your way in but once you were inside, it felt like you were in a type of shrine. Ice cavern on one side, lush tropics on another side, and it had a tram. Every raid instance needs a tram. In Mists, I’m hoping to see more encounters in outdoor instances. Less inside a dark cave or the side of a mountain. Maybe more in a dojo or up the side of a physical mountain (Mount Hyjal anyone?). Sadly this raid instance didn’t have the shelf life that other raid instances had. It felt really short because it came out in the spring. Right as summer rolled around, Trial of the Crusader came out and the players heading back into Ulduar stopped because that gear and challenge incentive wasn’t there anymore. Maybe the reason the instance is remembered so fondly is that most players didn’t have time to get sick of the place yet. Ulduar had 14 bosses (1 of them was Algalon). I think there’s a sweet spot somewhere if you’re looking at number of bosses in a tier and amount of time allocated to clearing that tier. Ulduar’s time frame was effectively 4 months with 13 bosses (and this excludes the hard mode variations). The other tier that ranks in my favourites list was tier 5 which had 10 bosses (6 in Serpentshrine Cavern and 4 in Tempest Keep). Firelands was the only one for tier 12 (effectively 7 bosses plus hard modes and a Baradin Hold boss). I liked the model which had more than one raid instance per tier. Tier 5 and tier 11 are good examples of this. You had a good amount of bosses that were spread out over multiple instances allowing raid groups to pick and choose where to start from each week. Instead of jamming them all into instance, having them spread out gave the feeling of not burning out as quickly. 2 – 3 instances of 3 – 5 bosses sprinkled throughout seem to be the most ideal and I hope they’ll revisit that consistently in Mists. Every raid instance needs a catch phrase. Activated hard modes of each boss had to be triggered manually by doing specific encounter things. This was first made popular in Obsidian Sanctum against Sartharion where the amount of drakes killed affected the difficulty level of the boss. Flame Leviathan was affected by the amount of towers that were killed. Deconstructor’s was triggered by whether or not your raid group DPS was high enough to destroy the heart. Nowadays all your raid leaders need to do is toggle a switch. Actually, now that I think about it, there were scalable hard modes. Iron Council could be engaged multiple ways depending on the order. Freya was just nuts. Orbituary on 25 man. You’d be hard pressed to find another encounter so demanding in terms of coordination required. When successfully pulled off, it was one of the greatest highs experienced because you were taking on an encounter where most players weren’t using their actual class abilities (other than the boarding team). Each catapult launcher had to coordinate navigation, sprints, fuel reloading and maintaining DPS. Those on the bikes had to make sure they were in position to retrieve launched players, drop oil slicks and so forth. Can’t remember what the siege ones did other than interrupts and trying to shoot fuel. Though I suspect if Ulduar had been out for another month or two, we would all have been annoyed with it. Maybe Pandaria will have a similar installation hidden on the island. This is a guest post by Aleph, who chronicled his early end game gearing process. Upon levelling my priest to level 80 and looking at joining my guild’s raid team as a healer, I found that I hit a barrier where I simply had no means of gaining any new gear that would get me up to Naxx10 level and therefore enter the raiding circuit as it were. Before I continue I should make a few things clear. I play in seasons. I play from June/July to September, then break until December and play until early January, taking a break until Easter time where I play for most of April. This makes it take amazingly long for me to achieve almost anything in WoW. So, brand new level 80! How to begin? Well, the first thing you’ll want to do is start developing a daily circuit. The length of your circuit (and therefore the amount of dailies involved) depends on your playtime per day. I had a very limited playtime and so I found it was easier to focus on one zone at a time. I started with Icecrown and the Knights of the Ebon Blade faction. I began at the Shadow Vault and gathered up the daily quests available there. I completed these and flew down to the quest hub at the Overlook which is on the cliff just east of the Scarlet Onslaught Harbor. I Completed all three of the dailies there, then flew to the Skybreaker and collected the daily quests there (I omitted the pvp quest because it took me too long to complete it). What people miss sometimes are the two quests on the ground. Upon completion of these quests you can either head over to the Argent Tournament or return to the Shadow Vault depending on the amount of play time you have left. You should repeat this until you have enough reputation to purchase some of the items from the Ebon Blade Quatermaster then move on to another faction. Make sure to go around and buy a tabard from the four factions you can get a rep tabard from, Kirin Tor, The Wyrmrest Accord, Knights of the Ebon Blade and The Argent Crusade. While doing your Daily rounds, go to the LFG interface and chose from the level 80 dungeons. These are: “Caverns of Time: Culling of Stratholme”; “Trial of the Champion” (this gives excellent loot); “The Nexus: Oculus”; “Ulduar: Halls of Lightning”; “Utgarde Keep: Utgarde Pinnacle”. Run at least one of these a day with your tabard for the faction you’re working on reputation for until you no longer need reputation with that faction. Then switch to another tabard and start the process again. While doing this, ask around for the generally accepted stats for your class/role for heroics are for your realm. On my realm it was around 1.5k spell power for a holy priest. It is possible that disc priests (or other classes) may have an easier time healing the easier heroics thanks to the damage mitigation. Luckily I had the dual spec and had shadow as my secondary spec. Some of my guild mates offered to take me to Violet Hold Heroic mode as a DPS. I accepted and got a lot of reputation and even a few healing items. If you get a chance to join onto a heroic as your off-spec, go for it; don’t worry about being a fifth wheel. Once you’ve done a few days worth of daily quests and have built up a decent buffer of gold, visit the auction house and look for any BoE Epics or Rares that you can buy. If you are unsure about what items to buy, ask your friends or guild mates. I bought two items, one epic and one rare item, these allowed me to begin running heroics. By now you should be almost ready to start doing heroics. This is where our tactic changes. You’ll want to set your hearthstone to one of the inns in Dalaran as this will be your new base of operations. If you haven’t been doing so already, you should start picking up the normal daily dungeon quest. Each day, log in at Dalaran and go to the Violet Hold where you will find two daily quest givers. On your left as you enter is where the normal dungeon daily quest can be found and on your right are the heroic versions. We’ll be turning right and collecting the normal daily quest for now. Once you have the daily quest put yourself in the LFG for the level 80 dungeons, making sure you’re queuing for the one the quest is located in! Then go out of Dalaran and continue with your daily quest circuit until you get into a group for a dungeon. Go to the dungeon then at the end, hearthstone (or take a mage portal) back to Dalaran and hand in the quest. It is important that you hand in the daily dungeon quest before the daily quests reset. The idea here is to gain as many badges of heroism and triumph as possible in the shortest time. As you may know, Badges of Heroism drop from bosses in heroic dungeons and Badges of Triumph are gained (at this point) from handing in the daily dungeon heroic. With this in mind, it is advisable to (If possible) try to set up a day where you and four other people clear all of the heroics at once. This will greatly increase the amount of badges you can get. Otherwise continue with your other dailies. Once you have collected enough gear from these activities and think you will perform well enough in heroic mode dungeons, join the LFG queue for Utgarde Keep (Heroic mode).The heroic dungeons are in a separate list to the normal dungeons. Go on the Utgarde Keep run and see how well you perform. If you think it is necessary, ask the other group members how they think you performed. If you did well, start joining some more difficult heroics. Look up which are the easiest and do those first. Then, as you get more gear, advance up the heroics. By the time you can do heroics like Halls of Lightning, Halls of Stone and Oculus, you should be looking at entry level Naxxramas, depending on the gear you have accumulated. If you haven’t, don’t worry. By now, you should have collected quite a few Emblems of Conquest and perhaps some Emblems of triumph from the heroic daily quest. These can be spent in Dalaran in the Horde and Alliance sections of the city. Each badge type has its own vendor. Look at the vendors and look for items which would benefit you the most. Work out what you should buy first (always go for the item that will give the biggest increase) and buy it. After a couple of days, perhaps weeks, depending on how many heroics a day you run. If it is possible, try to set up a day where you and four other people clear all of the heroics at once. This will greatly increase the amount of badges you can get. Also, don’t forget to get the heroic and normal daily quests each day because you can complete the normal quests while in heroic mode as well. A good measure for when you are Naxx ready is when you have over half of the superior achievement completed. That means getting at least eight i187 items or better before setting foot in Naxx. Some PUG Naxxramas groups might require you to have the entire superior (and even sometimes the epic version as well) but for guild runs, get a guildy to /inspect you to check out your gear. They will generally say whether you are undergeared or not in comparison with the rest of the guild. Just make sure you let the raid leader know that you are now available for raiding and they should factor you into the next run or two. At this stage, you will probably be under a trial period, in which make sure to put 110% effort into the raids so that the raid management see you as a player who benefits the entire raid and not someone who is a liability. This part is one where it is almost required to be in a guild. 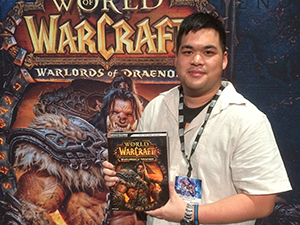 If you want to get up to ToC 10 level, you will want to be making regular forays into Naxxramas 10. So, once you’re in your guild run, clearing the quarters, gathering up loot left and right, how do you improve and get to the next level of content (Ulduar10)? Well, the best way to get to the next level is for your guild to get to the next level of content. At this point it is inadvisable to join any PUG raids as you will want to be fully focused on guild progression. If you think your guild is not moving fast enough, offer to take more responsibility in raids, work on tactics that work specifically for your guild, offer to set up the healing assignments or, even offer to set up another night of raiding for the guild (make sure you have the green light from above before doing this). This post is not about progression however. Once your guild has cleared the four quarters and has made decent attempts on the last two bosses, you should be able to begin Ulduar 10 raids, depending on your raid team’s gear/ability. Also look for any Obsidian Sanctum 10 or Eye of Eternity 10 raids as the two instances offer some nice items which can help a lot in Ulduar10. I would recommend that, once your guild is in Ulduar 10 and has cleared a few bosses that you join a Naxxramas 25 pickup group in order to gain a few items that will help you to advance in Ulduar. Guilds seem to advance fairly steadily through Ulduar, provided that their gear is adequate for the level of content and also that they have the drive to progress. Progression will be faster with a group of dedicated, intelligent people who generally know what they’re doing. If you are hoping to find guides to the bosses here, you can find Ulduar healing ones and Trial of the Crusader ones. If your guild has really got stuck into Ulduar10 and have arrived at Yogg-Saron, I would recommend attempting to take him down before moving on to the next raid. You don’t have to, but it’s a great fight in the way that all of the players must be on top form and concentrating 100% for the entire fight. So! Once you have successfully cleared Ulduar, chances are you have already attempted the newly refurbished Onyxia’s lair. You will get some nice gear upgrades from here, mainly the helm, but once this has been done, you are pretty much out of content before ToC10. This is where you have two options. Go on to ToC10 and give it a try. Return to Ulduar and gear up some more. I would recommend you give ToC a try unless you’re woefully unconfident with your gear level. This is where we utilize one of the great tools of the internet. You don’t have to follow this next step if you disagree or disapprove of this practice. I am talking about LootRank. There are a few sites out there that offer this service but I use Guildox for it. Mainly because if you are not familiar with the parameters you want, you can pick one of their sample templates which fills out the information based on the class/spec combo you use. You can also link your characters gear to it which helps by highlighting any items you already have. Once you press view loot ranking, a list will appear which has a section for each slot (and enchantments) which are ranked from 1 -7 in the order they appear. A good idea is going over to WoW Head and using the item comparison page to double check if the items are for you. This way you can make sure you’ll get what you need. You can check where the gear drops so for example I see that the top staff for me would be the Icecore Staff. I can see that it drops from Hodir in Ulduar10 H. It is important that you see the H as the staff only drops if you defeat Hodir before he shatters his rare cache. It is advisable to use this tool as you look to enter ToC10. After several raids at this content level, you should be more than ready to have a valid attempt at ToC10. However, perhaps your guild has not been gearing up as zealously as you have and do not want to go into ToC 10. While they will most likely leap at it, if they do not, you may want to look around your server to see if any other guilds are running it and see if they have a space for you on their next raid. If that fails, you could always attempt to PUG it, although this may not be very successful. The best plan, I think is to help your guildies to gear up quickly by giving any hints or tips you might have learned on your journey to ToC10. Patience is a key requirement for this stage. Please keep in mind that most guilds will charge into ToC10 before even defeating Yogg-Saron and so the last paragraphs or two are completely useless. Now you should be ready for ToC 10 man! Good luck and happy raiding! Looks like there were some undocumented changes made to Ulduar. Check out this post on Main Tankadin. (Thanks Honors). Hereâ€™s a quick summary from various sources (Forums, direct observations, things I heard second hand). Seems to be bugged. Doing FL with 2 towers is fine and dandy. But FL still has the 3rd tower buff on him even though thereâ€™s only 2 towers up. Vehicle targeting reticule looks really good. Gnomes have been busy. Enhanced the handling of vehicles. They turn much better. Choppers can pick up Pyrite and drop them wherever they like. Deconstructor seems to spawn a bajillion ads. Look at the main tankadin post above for a screenshot. Now throws Light and Gravity bombs during tantrums. Chain Lightning only blows up 2 targets. Iron roots: You can trinket out of them. You can blink out of them. Hand of freedom. Bring a Shaman with Earthen Power and call it a day. Shapeshifting works. Anything that can get you out of snares will work. Sunbeam visual effect seems to be missing. But the debuff on players is still there. Phase 3: Donâ€™t have to place the mines. The player loots it, uses it, and the head will automatically drop down. Mimiron has upgraded to smarter magnets. Vezaxâ€™s health reduced by 10 million. Saronite Animus health reduced by 2.5 million. Animus spawns after 6 clouds instead of 8. Check the comments for other nerfs. Iâ€™ll try to update this post with extra information. Well, the crew and I managed to spend a solid 150 minutes on handling four towers tonight. It was nothing more than a simple continuation of last weekâ€™s three tower attempts (but slightly longer). Yeah itâ€™s been nerfed slightly. But on the raid kill satisfaction scale, Iâ€™d probably set it at 7.5 out of 10. It felt good though, for sure. This is the third hard mode/meta achievement related boss weâ€™ve accomplished since we killed Yogg. Last week, we managed to take down Heartbreaker on Heroic which allowed us to leapfrog ahead of several guilds. Good for top 20 on an extremely competitive PvE progression server (WoW Progress ranks the server as 7th in the US). We utilized this strategy detailed on Tankspot. This involved having 2 launch teams consisting of 3 players each. It was practiced extensively on the week before with only 3 towers up. Last night was when weâ€™d put it to the test. Despite having a slightly different launch team, overall I was really happy with the outcome. I think we only suffered a handful of deaths at the end but we managed to get the kill all the same. Working on flawlessness can come later. It took us around four successful shutdowns before we took him out. A great thing to do before the encounter is to spend a minute or two seeding the entire area with Pyrite. Blast those suckers down as they come in. Anyways, the main problem we had for the majority of the evening was retrieving our launch teams intact. Our bikes had difficulty pinpointing where they were on the ground and which demolisher to bring the teams back to. After a variety of tactics, assists were automatically handed out to everyone. This allowed them to mark themselves. The launching demolishers were assigned three marks. The launch teams were also assigned three marks. Every time a player was launched, they would designate themselves. Letâ€™s say we had a Demolisher launching Bruno and Broseph. The Demolisher would be marked with a star. If Bruno was about to be launched, heâ€™d tag him self with a square when he landed. This way, he can coordinate with the chopper that picks him up (square to star). Just as Bruno is about to be delivered, Broseph who is manning the guns on the Demolisher would then load himself in allowing Bruno to jump into the gunnery position of the Demo. Once Broseph gets launched, heâ€™d tag himself with the square. Here is the macro that all the Launch Team members need for FL. This will put a skull on Matt’s head. All in all, a fairly fun encounter. Excellent work by all the players involved and those that were here for previous attempts but could not make it. I just discovered this pro tip yesterday from a Resto Druid app. He mentioned to me as we were clearing out Mimiron trash. If you want to shave some time off in your raid, work the first trash pull and secure a Spider bot as quickly as you can. Then have that player power jump over the rest of the mobs all the way to the tram. He activates the tram, heads over to Mimiron, and then starts the encounter. That player has to die. At that point, the teleport at the Spark of Imagination should now be active enabling the rest of your raid to enter in. Some of you guys probably know this. But for the rest of us that didnâ€™t, itâ€™s a neat trick that should shave some time in your raids. We used this method in the last trash pull to gauge exactly how much space was needed. It might take you a trash pull or two to get used to the range. But it can be done. On a side note, youâ€™ll notice things have been slightly shaky around here. The server move has been complete. A very special thanks to our sponsors (and hosting partner) Byte Me Gaming. The contact forms are not working at the moment and Iâ€™m trying to resolve that. So I apologize in advance if youâ€™ve sent in anything recently. Use my personal email for the time being in order to get in touch. Zen (noun): school of Mahayana Buddhism asserting that enlightenment can come through meditation and intuition rather than faith; China and Japan. So, how does this pertain to healing in WoW you ask? At it’s base level, meditation is a tool that is used to make the mind and body whole, to realign a persons energy through focus and insight. It is also the realization of an inherent natural wisdom and virtue that fills us all. The most basic function of a healer in WoW is to mend the raid and make the raid unit whole again. Is this far out there? Probably but bear with me a bit. We heal our raid through focus and intuition. We predict incoming damage and set heals and preventative measures accordingly. We trust our intuition, and apply logic to make our healing target decisions rather then trust blindly that our heals will find their mark. We do so through intimate knowledge of our classes and the raiders around us. It’s like hitting the “zone” that athletes talk about. You become centered, super focused and just make amazing saves and pull out all the stops without even realizing you are doing it. I’m sure you’ve done it before. You’ve been in a fight where afterward someone comments “I have no clue how you healed through that!” and you have to stop and think back on it, because you don’t remember doing anything special, you just did it. I’ve always referred to healing in WoW as a very fluid thing, it is very natural and adaptive in nature.Ã‚Â It’s something that if you are a healer, it just flows from you without much thought. For me the true zen of healing comes out during my guild’s heroic raids. A couple nights ago we were doing General Vezax (working on our second kill on him at the time).Ã‚Â I had assigned three healers on the main tank, a Resto Druid, Holy Pally and Disc Priest. Vent was quiet as dps wait for the call to burn down a vapor and interrupters were waiting for the flame spheres to pop up around Vezax. Early into the fight our Paladin MT healer get’s hit with a shadow crash and then very shortly there after an interrupt is missed due to a lag spike and a Searing Flames goes out. The Paladin dies as a result. Without saying anything I see our second Holy Paladin shift his position and take over tank healing, while the rest of the healers move to fill the healing gap throughout the raid. Later on in the encounter our Vapors wound up in the back of the room, I watched as the healers rotated on their own, without any direction. Healers got their mana back and then relieved the tank healers so they could regen then the tank healers took back over. I watched my healers work as one unit, without any spoken or written words passing between them. That to me was a moment of zen similar to the story of the Flower Sermon. Everyone used logic and intuition to work as one cohesive body and win the fight without a word even having to be spoken. I’ve had other people tell me about how they get into “the zone”. Some have pre-raid rituals, and yes I mean rituals. I have a friend who before a raid sits down on the floor takes some deep breathes and tries to release any stress he’s gathered during the day before the raid through meditation. I have another friend who drinks a can of coke, eats a bag of Andy Cap Hotfries or hot-wings and then sits down to raid, he compares this to say sacrificing a chicken to the raiding gods. Another of my associates listens to classical music while he’s healing, keeping it just low enough to replace the game music but still hear directions in vent. Me before a raid I listen to some music likeÃ‚Â John Williams and the Indiana Jones theme to get myself in adventure hero mode. So what about you? Have you experienced a moment like we did with Vezax? Do you have a pre-raid ritual to get you into your zone? Have you hit your Zen through healing yet? That is it for today, until next time. Happy Healing! ItÃ¢â‚¬â„¢s been done. Your main tank is dead. Your healing corps is decimated. It seems as though your stealthers continue to be found and shredded. Plate armor is sundered and scattered across the battlefield. The clothwearers torn apart with nothing left aside from their robes. WhatÃ¢â‚¬â„¢s the best course of action you can take to assist your raid? Suiciding yourself and wiping along with them. DonÃ¢â‚¬â„¢t give me the rallying cries of Ã¢â‚¬Å“Mimiron will never take me alive!Ã¢â‚¬Â either. You canÃ¢â‚¬â„¢t solo a boss unless heÃ¢â‚¬â„¢s within one or two spell casts of death. How many times have I witnessed a player single handedly declare victory against a raid boss? I can count that number on one hand. So donÃ¢â‚¬â„¢t be a hero unless you can actually do it. HereÃ¢â‚¬â„¢s how you can make yourself useful when a wipeÃ¢â‚¬â„¢s called. Ever wondered what the fastest way to die on each boss was in Ulduar? Oh and a special note to healers. When a wipe is called, there is thing that you have to actually do that can help hasten the process. Wipes when: YouÃ¢â‚¬â„¢re down to 3 choppers, no tanks, and maybe a few demolishers. Unless the bucket of bolts is at a ridiculously low level, youÃ¢â‚¬â„¢re done. Methods: Jump out and close within melee range of the boss. If the Flame Vent doesnÃ¢â‚¬â„¢t get you, the rockets will. Wipes when: Main tank is dead with no other alternatives or when a Construct gets pulled into the raid and gets stupidly detonated taking out the entire crew. Methods: Jump into a scorch. Cast a spell before Flame Jets connects. Hug a Brittle construct before blowing it up. Wipes when: No tanks are alive and that big honkinÃ¢â‚¬â„¢ Titan guy does what Right Said Fred sings by doing more than a little turn on the catwalk. Yes, IÃ¢â‚¬â„¢ve seen pickup raids demolished by that one trash mob. Also consider a bailout when an off tank isnÃ¢â‚¬â„¢t able to tank quick enough and the debuffs continue to stack too high on the main tank. Methods: Go die in a fire. Literally. The blue fire will do the trick. Give big honkinÃ¢â‚¬â„¢ Titan guy a hug. If itÃ¢â‚¬â„¢s phase 2, the plan is to try to pop a breath mint into RazorÃ¢â‚¬â„¢s mouth by getting in front of him. IÃ¢â‚¬â„¢m sure heÃ¢â‚¬â„¢d appreciate some juicy fruit when youÃ¢â‚¬â„¢re being blasted with his Flame Breath. Wipes when: Completely pounds the crap out of your main tank. Or when Joe Paladin forgets to run out of the raid with a light bomb. Also happens when Deconstructor wolfs down some grilled repair bot burgers. Oh yes, and if your raid forgot to eat their wheaties this morning and managed to close in on the enrage timer. Methods: See that guy thatÃ¢â‚¬â„¢s glowing white? Give him a big hug. LetÃ¢â‚¬â„¢s not forget the guy in black and purple either. Run to him! Tantrums, when they occur, will auto-slaughter the raid. Wipes when: One of the tanks gets Falcon (Fusion) Punched. Raid eats a green rune and is too slow getting out of it. Anytime those Iron Council folks are basking in blues of glory. ThereÃ¢â‚¬â„¢s a multitude of causational factors that could lead to a wipe. Methods: Do everything I mentioned in the last paragraph. Oh, and hug the small Iron Dwarf. HeÃ¢â‚¬â„¢s the lonely one of the bunch. Gets frequently picked on all the time. When heÃ¢â‚¬â„¢s doing that Overload thing, heÃ¢â‚¬â„¢s just trying to unload his problems. It doesnÃ¢â‚¬â„¢t hurt. Wipes when: Eyebeam fail. Stone grip fail. Tank-falls-off-ledge fail. No one in melee range of Kologarn fail. Methods: Just repeat everything above. Stand in beams or jump off the ledge or run far away from him. Wipes when: Not enough players absorb a sonic screech. Alternatively, difficulty with the pull. If you can master the pull you can master the boss. But the pull is what gets to raids. Methods: Just get eaten up by the various cats. Stand in the void zone. Wipes when: Frozen blows dominates your entire raid. Tank dies. Raid doesnÃ¢â‚¬â„¢t know how to either keep moving or watch for camp fires. Methods: Stop moving. Avoid the big snow drifts and get flash frozen. Stand under falling icicles. Wipes when: Either the arena team doesnÃ¢â‚¬â„¢t hold out long enough or the gauntlet team is too slow. In phase 3, it happens because a tauntÃ¢â‚¬â„¢s not quick enough. Methods: During the second phase, if youÃ¢â‚¬â„¢re gauntlet, do run into the line of fire. Do stand next to the guy with the fire shield icon above him. If youÃ¢â‚¬â„¢re in the arena, make some friends. During the third phase, dive into the lightning streams. Methods: Ã¢â‚¬Â¦But AoEing detonators leads to a speedy death. If itÃ¢â‚¬â„¢s on Ã¢â‚¬Ëœshrooms, look for the player who is flashing lightning and stand next to them. Lashers are a bit of a pain to die to however. FreyaÃ¢â‚¬â„¢s one of the worse bosses to wipe on because it can take a while for everyone to die. Wipes when: I donÃ¢â‚¬â„¢t even know where to start. Missing tanks? Nuked healers? Not enough DPS? It could be any number or combination. Methods: HereÃ¢â‚¬â„¢s a quick list. Phase 2: Get up close to the boss. Let the fires engulf you or have the entire raid stand in one direction and simply eat the arcane guns. Phase 3: Run into any bots you see. Bomb bots are great for this. Phase 4: Run into land mines. Wipes when: Healers run out of juice with no Saronite vapors around. Lack of interrupts on Vezax. Tank faces a super saiyan General Vezax who dishes out 50000 damage. Yeah. Happened to us before too. Not pretty. Methods: Stand in a Saronite vapos for more than 7 ticks. Hug Vezax without interrupting anything. Let him warm you up some. Wipes when: Anything bad that can happen will happen. Players become magically blind to the color green. It happens. Method: Run into clouds and run into the green beams emanating from Yogg-Saron. For other bosses in Ulduar, check the Ulduar Healing Strategy Page. Thorim is the lord of storms, and brother to Loken. He is one of the Keepers of Ulduar. The fightÃ‚Â is broken down into 3 phases, with phase 2 having two parts. First, lets see what Thorim can do. Sheath of Lightning – When the encounter begins, Thorim will coat himself in an almost impregnable sheet of lightning. Charged Orb – Charges an orb in the arena with the power of storms. The tower will discharge Lightning Shock which can chain to multiple people in close range to eachother. Summon Lightning Orb – Sends a ball of lightning down the corridor towards the players, laying waste to everything in it’s path. 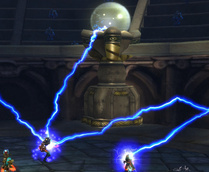 Chain Lightning – Thorim casts a lightning bolt into the party that increases in damage the further it jumps. Unbalancing Strike – Reduces the tanks defense by 200. Enrage – When you start phase 2 you have 5 minutes to reach him before he enrages and clears the raid out. Thorim has a lot of friends who want to play with you. Those two are like mini bosses. They don’t hit too hard. Waves of trash will consist of these mobs. The fight itself has 3 phased, with phase 2 having two parts. You enter the arena to see a giant Jormungur facing off against opponents of the opposite faction. They are easily dispatched and don’t really hit hard on tanks. Clean them up and get ready for phase 2. Phase 2 is split into two sections, a Ramp/Gauntlet group and an Arena / pit group. We’ll talk about the ramp group first. The Ramp group will normally consist of one tank, seven DPS and two healers. Speed is the biggest factor here. The faster you get to the end of the hallway, the sooner you can start phase 3. For healers you want someone who can snap big heals, or heals on the move. We found that druids and holy paladins work incredibly well for the ramp group. Large effective heals and lots of mobility. There will be three groups of Warbringers along your way and a giant golem at the end of the hall that sends death down one side at a time. We assigned someone to call out which side to move to. As a healer, don’t worry about keeping someone who stands in the line of fire from the golem alive, they’re going to die. It’s pretty easy to heal the Gauntlet, just keep the tank alive and burn through as fast as possible. The Arena group has a it’s own tree of woe to deal with. The aforementioned adds will be flooding into the arena to get a piece of us would-be adventurers for ruining their entertainment. Easiest way to do it is have tanks set up an AoE pit in the center of the arena. We use three tanks (bear , paladin and warrior just for reference). The druid and the paladin tank the vast majority of the mobs while the warrior pulls the champions off to the side slightly (see triangle on the diagram) to keep them from whirlwinding the dps. 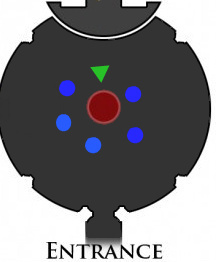 Healers (blue circles) should spread out around the AoE pit to minimize the impact of the Storm Hammers. Priests should be ready to mass disspell the Runic Shield from the evokers. Group healing helps a lot in this part of the fight.Ã‚Â CoH, Chain heal, glyphed Holy Light and even Wildgrowth will help keep the dps in the AoE pit up. Just keep an eye on aggro happy AoE damage dealers though, sometimes warlocks like to explode without warning here. Healers that are spread out should watch for Lightning Orbs and be ready to move quickly, least they chain the damage to other players. If you get snap aggro from adds through healing, you should run through the AoE pit to give your tanks a chance to snag them with a taunt or even just Consecrate / Death and Decay to grab them. Continue to burn down the pit, picking off Evokers and Champions as you can until your ramp group reaches Thorim and starts phase 3. Name of the game is survival. Heal your rear off! keep everyone up, especially tanks and you’ll be good to go. Once you reach Thorim’s platform he jumps down into the arena. A tank has to pick him up right away while everyone else works on adds. Thorim hits reasonably hard when he connects so it is suggested to have a few healers on the tanks. Normally We put 3 healers on the two Thorim tanks, Druid, Paladin and a Disc priest have been wonderful for evening out damage and making Unbalanced Strike transitions easier.Ã‚Â As the fight goes on, Thorim hits harder and harder, much in the way of Gruul the Dragonslayer, but three healers should be enough to keep the tanks alive. The rest of the raid and healers need to be spread out around the room, more then 10 yard away from someone if you can. When Thorim Chain Lightnings, it can have disastrous results. While you’re healing keep your eyes peeled for a white pulsing line going between him and one of the pillars. At this point, you want to run away from that line as quickly as possible. After the line is done energizing him, he will cast an arch of lightning in a 60 degree coneÃ‚Â towards wherever he pulled the power from. If you’re caught in it it will hurt. Stop your casting and move fast and then resume healing. 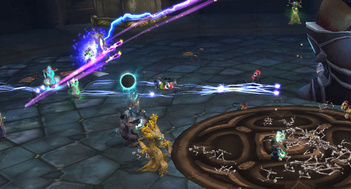 The tanks will keep rotating so make sure they are topped off while your raid healers keep track of everyone else. Tank healers have to be careful to make sure they switch to the new tank quickly otherwise you run the risk of the new tank eating two large strikes back to back later in the fight. In my opinion the hardest part of this encounter is phase 2 for arena healers. There is just a lot going on. There’s a ton of movement, a ton of raid damage and a ton of situational awareness needed to make it through. Heads up Healing comes in very handy in the arena as it lets you move before you’re splatted. It also helps you when you can see the mobs turn to go take out that AoEing warlock before they actually hit her (looking at you Jahadura!) and splatter their remains all over the arena floor. Once you get this part down, the rest of the encounter is no harder then anything else you’ve faced so far. Now for the good stuff. Also a little poll here. My guild leader things Thorim sounds like Patrick Stewart, I think my guild leader is very mistaken. What do you guys think? Does Thorim sound like Patrick Stewart?